Engine installed three years ago, including new engine mounts and re-balanced propeller (52"). The engine has therefore had little use and is reported to be economical. At 1500 rpm the engine develops 170 bhp. Water cooled reliable twin Disc MG 509 Reversing Gear (4.5-1 reduction). Compressor fitting to main seacock. New batteries (2 x starter, 4 x leisure batteries). Vetus diesel generator, hardly used, which is water cooled. Re-plumbed and re-wired in (Arctic) marine grade cable. Two interconnecting fuel tanks, with an electric pumped 250 litre day tank. Hull is 12 mm, new Steel, with foam insulation throughout, and 9mm marine ply finish. Hull shot blasted and 2 pack epoxy applied; 2 coats of international tide coat and 2 coats of antifoul. 16 new, large welded anodes. 2 x electric, (TECMA) marine macerator toilets. The study cabin, could be re-purposed as a cabin for berths. In-built Bosch Induction hob and electric fan oven. Firebird Oil fired central heating. Multifuel stove in main saloon. Hydraulic power pack (Wills Ridley). This tug has been beautifully converted into what is now a stylish liveaboard, as well as a displacement power boat, in full commission. This boat is therefore the perfect combination of smart accommodation afloat, with the ability to take to the seas in safety and comfort. 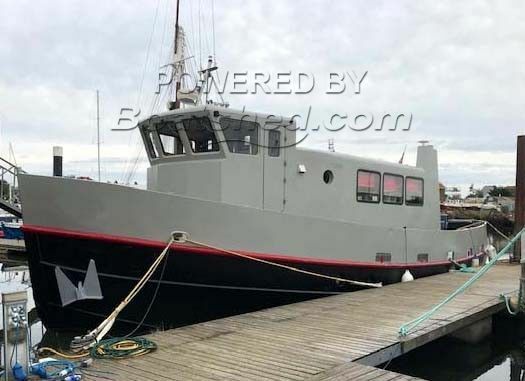 Originally built in 1958, by Appledone in Devon, the current owner purchased the hull in 2012, commissioning a professional refit, including a rebuild of the hull and addition of the upper helm and accommodation area and topsides, in 12mm steel. The boat was surveyed in August 2018 and has since had all recommended work completed. This survey is available and demonstrates the owner’s attention to detail completing this refit. The accommodation is set over two floors, including two cabins, heads and saloons and a separate engine room and workshop area. There is a good deal of storage space and potential to convert a cabin currently used as a study into an additional double berth. The external and interior finish is stylish and new and the overall design has been carefully considered. This boat has an incredible amount of potential, from an elegant floating home or holiday getaway, to a stylish platform for travel and potential commercial activities. This Converted Tug Liveaboard has been personally photographed and viewed by Jayne Markham of Boatshed Essex. Click here for contact details. Please note this comments section is public. Please do not post your personal details here. To enquire about purchasing this boat, please contact the broker directly at jaynemarkham@boatshedessex.com. Please read our commenting guidelines before posting.